Santa Monica Bay - Now At Higher Risk of a "Stealth Tsunami"
In the 1950’s, prior to the California surfing craze, riding an inflatable raft in Pacific Ocean surf was more fun than anything else I could imagine. However, growing up in Burbank, California at that time implied a landlocked existence. Luckily, our own natural water park, at Sorrento Beach in Santa Monica was only an hour away by car. 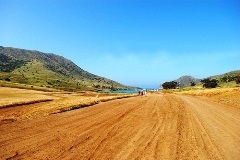 Several times each week of summer vacation, my mother drove us to the shore of that crescent shaped bay. In later years, polluted runoff entering Santa Monica Bay contributed to rising cancer rates among L.A. County Lifeguards. The statistics were enough to deter swimming at Southern California beaches. Even though my visits to the shore were rare, I often dreamed about Santa Monica Bay. In those dreams, I stood ashore as an unseen tsunami approached from the west. 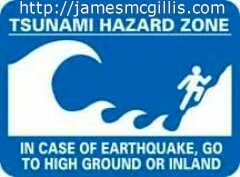 After the Indian Ocean Tsunami in December 2004, I wondered about the tsunami threat in Santa Monica Bay. When the March 2011 tsunami hit the east coast of Japan, some of the heaviest damage occurred in and near Sendai. Sendai, Japan stands at the head of a crescent shaped bay similar to Santa Monica Bay. While reviewing maps and pictures, I could see a tsunamical signature in the creation of Matsushima Bay, just north of Sendai. That “bay within a bay” is an archipelago of small, but towering islands, most having little or no beach. Lost in prehistory, a cataclysmic tsunami struck the coast at Matsushima. That huge series of waves quickly inundated and eroded the land, sweeping most of it out to sea. Today, those small, towering islands are all that remains of headlands that once overlooked the Pacific Ocean. Earth scientists have long known that crescent shaped bays amplify wave action by focusing it at the head of such landforms. Within the city limits of Crescent City, California, Crescent Bay is one of half a dozen crescent shaped inlets. 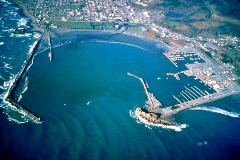 From the Great Alaskan Earthquake of 1964 to the Japanese Earthquake and Tsunami of 2011, Crescent City often takes the brunt of Northern California tsunami activity. According to researchers at nearby Humboldt State University, the city experienced tsunami conditions more than thirty times between 1933 and 2011. With the help of satellite mapping and paleo-flood surveys, there is sufficient data to prove that crescent shaped bays do more than amplify tsunami. It is my thesis that tsunami help to create crescent shaped bays, both large and small. As sea levels rise annually at a rate between 1.7 mm and 3.3 mm, the threat of destructive tsunami also rises. Each cubic foot of water weighs over sixty-two pounds. Even a small rise in sea level places staggering extra inertia behind waves concentrated by a crescent bay. In Japanese, tsunami means, “harbor wave”. 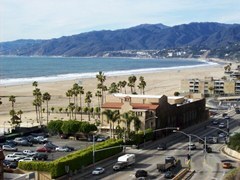 Reflecting on my dreams of Santa Monica Bay tsunami, I now pay closer attention to crescent shaped bays that I visit. Three of my favorite Pacific Ocean bays are Natewa Bay, Catalina Harbor and Hanalei Bay. Each of the three bays is unique and beautiful. Their common heritage includes both tsunamical creation and vulnerability to future tsunami. In 2001, I visited Natewa Bay, Vanua Levu, Fiji. Immediately, I was struck by its size. Throughout the South Pacific, it is second in size only to Subic Bay in the Philippines. Our buree at Lomalagi Resort overlooked the head of Natewa Bay. Each day, we watched as the tides emptied and then refilled the bay. Stripped down to old coral and bedrock, the long, narrowing bay magnifies any tidal action. If not actually created by tsunami, Natewa Bay appears to have hosted many such events. Around 2005, some development wags proposed building human made islands in the upper reaches of Natewa Bay. Although the development website still exists, we see no sign of actual development. With high tsunami risk at Natewa Bay, near shore development makes no sense. The small town of Two Harbors is located at Isthmus Cove, Santa Catalina Island, California. Facing the Southern California coast, Isthmus Cove is a reliable anchorage for pleasure craft. On the far side of the isthmus is Catalina Harbor. Similar to Natewa Bay, “Cat Harbor”, features a south facing underwater canyon. The isthmus, a gently tapered mound of earth, rises only sixty-two at its high point. If a thirty-foot tsunami arrived from the south, the isthmus at Two Harbors could easily become a “tsunami sweep”. It is easy to visualize a tsunami-induced flood topping the low isthmus and spilling into Isthmus Cove, on the far side. Hanalei Bay, on Kauai, Hawaii is a classic tsunamical bay. Lying at the foot of the Hanalei River Valley, there is no deep canyon beneath the bay. The mouth of the almost circular bay opens to the northwest. Rather than sediment from the river extending into the Pacific Ocean as a delta, exposure to tsunami and other extreme wave action has carved out a semicircular bay. Within the gentle sloping river valley, great tracts of farmland remain vulnerable to future tsunami. In my recurring tsunami dream about Santa Monica Bay, I stand onshore. As I look out to sea, the ocean water recedes. Then, with no warning, I see a large tsunami racing toward me. I turn, as if to run from the approaching wave. As the towering tsunami overwhelms me, I find that it is made of cloudy foam. At the time of my inundation, the great wave evaporates and whisks away like a fog. In my dreams, the Great Tsunami of Santa Monica Bay causes no harm. In our real world of rising seas and continued earthquake activity, we may not be so lucky.